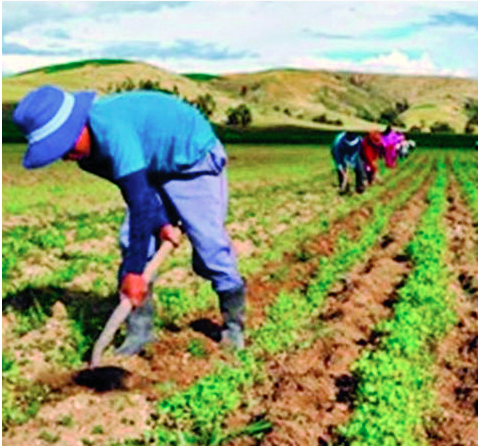 The departmental head of the INIAF, Rogelio Maydana, said that the jatun puka potato variety could be grown at more than 3,200 meters above sea level, and that it was tolerant to blight (a fungus that causes spots on the leaves) and to the potato virus. “During the first harvest, the producers of the Association of Potato Producers obtained an average yield of 31 tons per hectare in a three-month cycle. These results will expand the production of this variety of industrial potatoes and thus offset the importation of Peruvian potatoes,” said Maydana. The authorities of the municipality of Patacamaya, representatives of the Faculty of Agronomy of the University of San Andres (UMSA), producers, technicians, and leaders of the region were involved in this work. In 2018, Bolivia imported at least 28,750 kilos of fresh potatoes; 3.8 million kilos of frozen potatoes, and 818,459 kilos of chuño and tunta from Peru. This imports amounted to US $ 309,498, according to data from the Bolivian Foreign Trade Institute (IBCE).